Come for the party, stay for the kebabs! 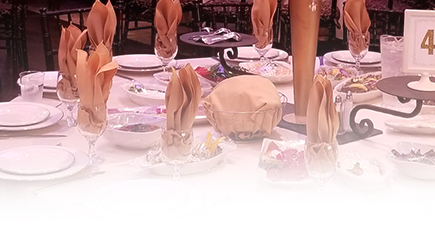 At Olivia Event Venue, we offer guests a variety of dining options—hors d’oeuvres service, family-style dining, fine dining plate service, or buffet-style dining. We serve only the finest and freshest ethnically-inspired cuisine. Though our Mediterranean dishes (like the mouthwatering steaks we serve hot off the skewer) and Middle Eastern fare are our specialties, Olivia’s world-class chefs are capable of making any type of food, including kosher and halal creations, for your special occasion. We offer set menus when you book with us, but we are also flexible if you prefer to customize the menu yourself. Let us know exactly what you want, and our team will make it happen for you! Food is an essential part of any party, and at Olivia, we understand the importance of serving delicious catering to your guests. Keep your guests’ hunger at bay by offering delicious, bite-sized appetizers for cocktail hour, during a presentation, or periodically throughout the evening. Create a buffet menu of your favorite selections, then let guests help themselves to whatever they want. 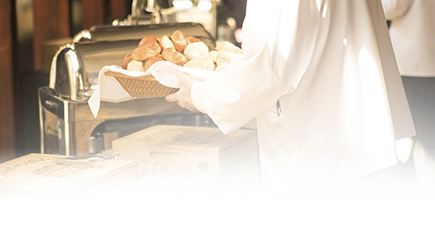 For more formal occasions, allow our professional catering staff to serve you. Popular in many cultures, this serving option places large portions of each food selection to be placed at the center of each table and shared. A great way to enjoy ethnic cuisine! As our most formal and indulgent serving style, table service at Olivia includes 3-5 courses and the full attention of our professional service staff. This is an ultimate dining experience! Because Olivia Event Venu’s cuisine is always prepared fresh and made to order, we only offer menu tastings on Thursdays. By limiting the days we offer food tastings, we can guarantee that the food will remain consistent with our standards of excellence, and we can also ensure that no food is being prepared unnecessarily or wasted. Those who are interested in a menu tasting can make a reservation with the venue manager in advance by calling (818) 556-5299. Thank you! We look forward to seeing you. Although Olivia’s skilled chef can expertly prepare nearly any type of dish and can accommodate a variety of dietary preferences, we do understand why some clients would decide to work with outside catering—especially in the case of specialty tables and brand-name dishes. If you decide that you would prefer a different catering service than our in-house chef, we will do our best to work seamlessly with your outside company to make sure everything goes as smoothly as possible. Take one step closer to hosting your big event one of our beautiful venues! Select your desired date by clicking below to fill out the simple booking inquiry form.